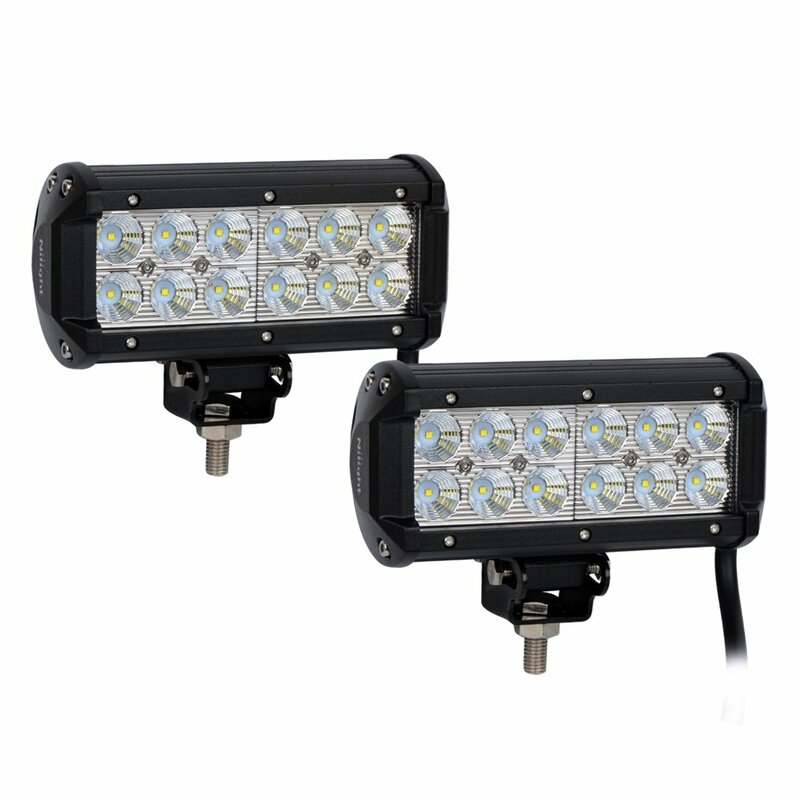 Home › Energy-Efficient LED Lighting › Nilight 2Pcs 6.5" 36W Flood Led Work Light Off Road Led Light Bar Super Brigh..
Nilight 2Pcs 6.5" 36W Flood Led Work Light Off Road Led Light Bar Super Brigh..
Specification: LED Power: 36W (12PCS3w high intensity LEDs ) Voltage: 9-32 V Beam: Flood beam pattern LED color temperature: 6000K Working life: 30000 hours Working temperature: -40~ 85ae Waterproof rate: IP67 Certificates - CE, RoHS, IP67 Material: 6063 Diecast aluminum profile, stainless steel bracket, PC Lens Compatible with both 12V and 24V vehicle The glass surface is made of Quart Lens with high light transmission The suitable design for heating elimination. The high performance of tight waterproof, dustproof, quakeproof. Applications: Indoor and Outdoor uses Back up light Off Road Lighting Truck, Trailer Interior and Exterior Lighting Construction Lighting Garden, Backyard Lighting Boat Lighting ATV, vessels, bus, off-road vehicles, trucks, fire engines, forlifts, mining,trains, tanks, etc. Easy to use, no manual. If you do not known how to install, please look forprofessional installation Package Include: 2pcs 36w LED Off load Lamp They are aftermarket parts. NOT D.O.T. approved. Do not use if D.O.T. isrequired. For off road use only. Laws concerning this product vary from state/province to state/province. Your state/province may prohibit its use on public roads or restrict its useto novelty, show use, off-road areas, or race facility areas only. In some states/provinces off-road uses are also prohibited. The manufacturer and retailer assume no responsibility for any use orapplication of this product in violation of any applicable law. Before installing this product, please check your state/provincial andlocal/municipal laws and regulations. Note: The item of this listing is a pair--2 pcs. There maybe some unexpected causes which can affect the items condition . So friend,after receiving the item,if you have any question about the parcel ,please do not hesitate to contact us. Once got it,we will try our best to solve it for you immediately.